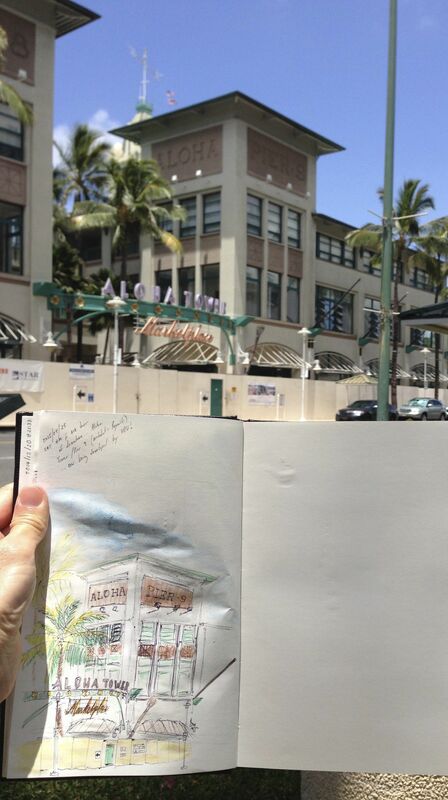 Our chapter held a sketch event this Sunday morning at Ala Moana Shopping Center. 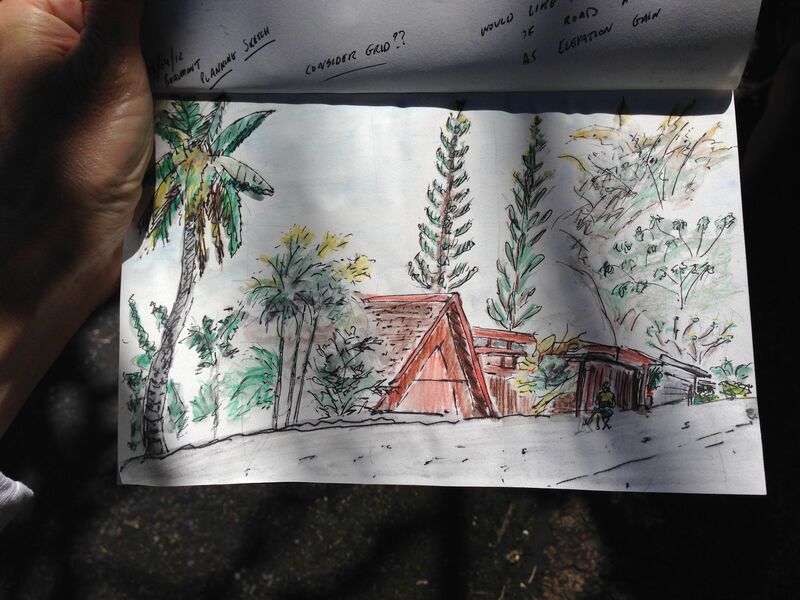 It was good to see a few returning sketchers, as well as newcomer Mayumi. The weather was great – occasionally overcast and breezy. From the top level of the parking garage we had a view of the shopping center in front of Ala Moana Beach and downtown Honolulu with the Ko’olau Range as a backdrop. Although chosen for just that reason, our location proved almost overwhelming due to the plethora and detail of targets. It was a challenge not only to pick a scene, but also to distill it while truthfully depicting the subject. This is a location with so much potential that we will have to return someday. We jumped in at 9:30 and were yet again surprised by how quickly 11:00 arrived – time for show-and-tell. Pencil, pen, watercolor, crayon, and watercolor pencils all made an appearance. 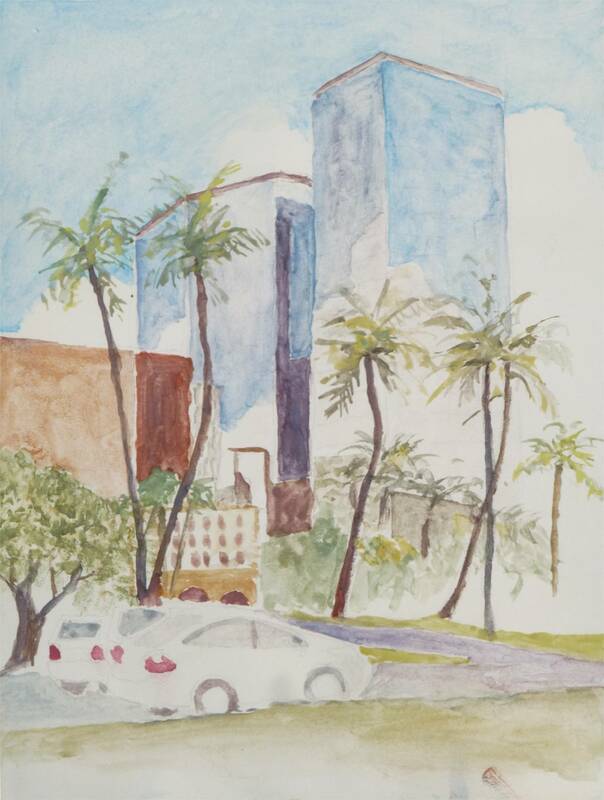 Given the similar subjects we chose (e.g., cranes, the shopping mall with scaffolding, and downtown Honolulu), it was interesting to see how differently the challenges of perspective, depth, and contrast were tackled. I came away with a greater interest in crosshatching and a desire to explore the technique more in my own sketches. Hope to see everyone at our next event! I have always found that old cars have more character than what leaves the factories today. 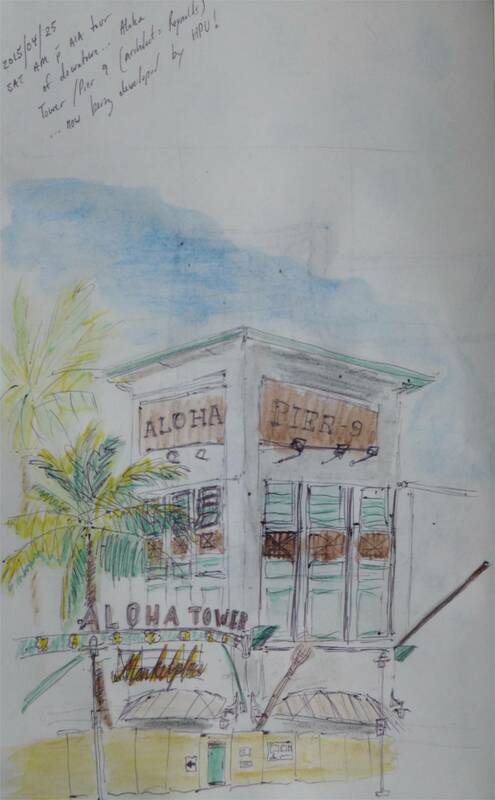 Over the past three days I went around the neighborhood to sketch a few I have noticed on my commute. It took me a little while to get the proportions right – I always struggle with perspective when my sketch subject has essentially no straight lines. Wanting to take a break from my standard pen sketches, I also had to re-familiarize myself with pencil. After about three hours of sketching these were my results. 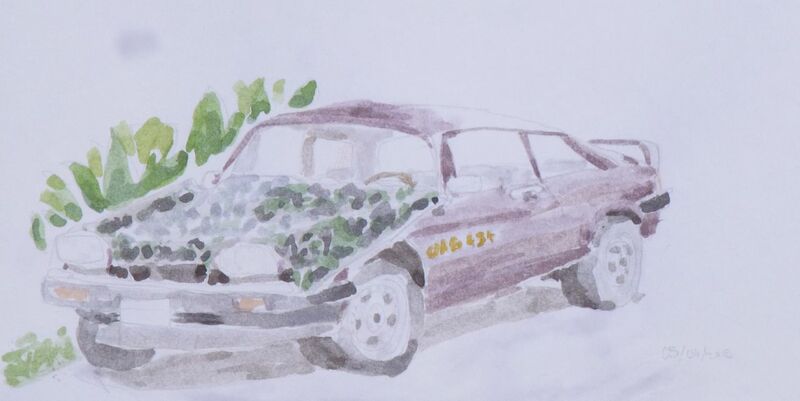 Following a little online investigation my guesses as to what I sketched are a 1980s Buick Riviera, 1990s Jaguar XJR-S coupe, 1990s VW Vanagon, and possibly a 1990s Suzuki Jimny. 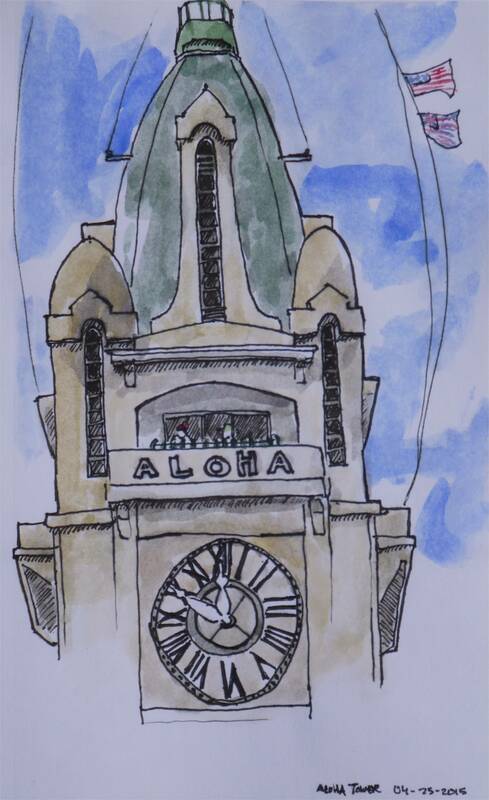 Last Saturday we (AJ, Harald, and I) attended the American Institute of Architect’s (AIA) Architecture Walking Tour “Downtown Honolulu – 20th Century Architectural Styles”. Although AIA regularly offers tours throughout the year this one was only offered once in 2015 as part of Architecture Month. For two hours I learned about the history and styles of buildings in the business district – a place I have spent little time in and have not cared for much before. By the end of the tour I no longer saw downtown as just a jumble of high-rises. Each building has its own story. For example, the No.1 Capitol District Building was originally the site of the first Royal Hawaiian Hotel commissioned under King Kamehameha V and opened in 1872 to host foreign dignitaries and friends of the royal family. The hotel was then converted to a YMCA in 1917 and used by the military in World War I and II. 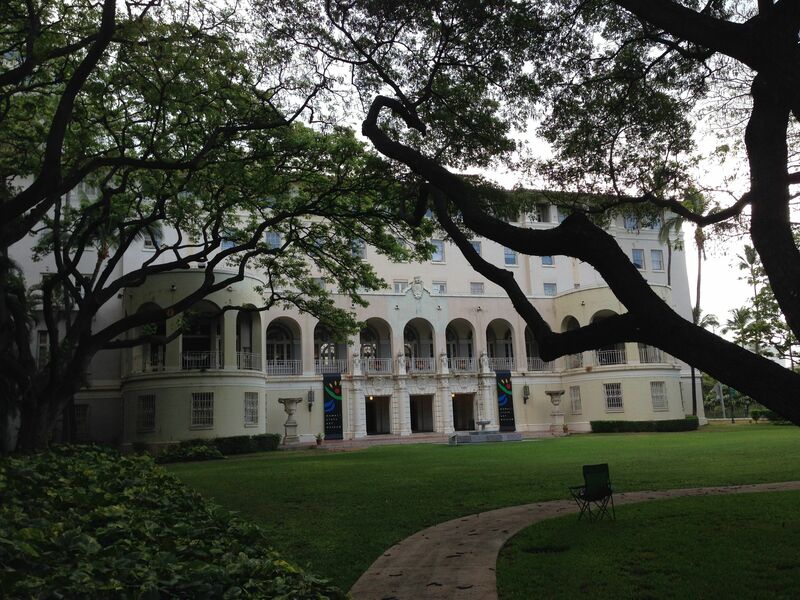 In 1926, while in military use, the hotel was demolished and a Spanish mission revival style building was erected which has housed the Hawaii State Art Museum since 2000. 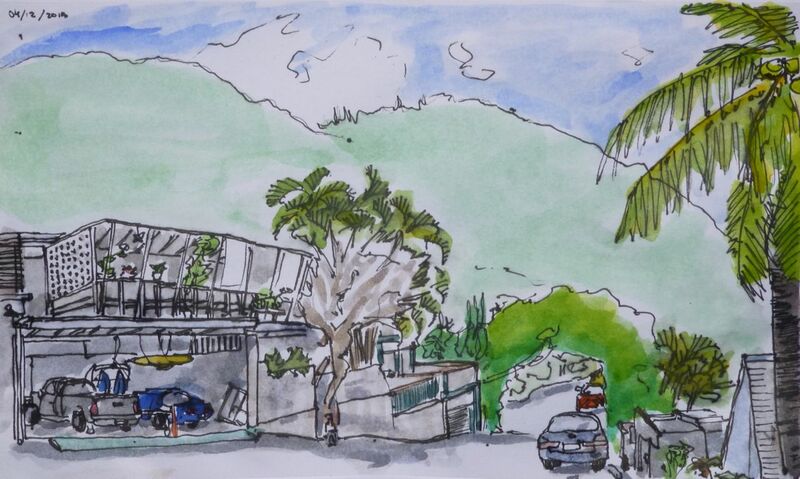 An art museum in Honolulu that I was aware of, but had not been to. Will have to pay it a visit soon… It is located on the aptly-named South Hotel Street. 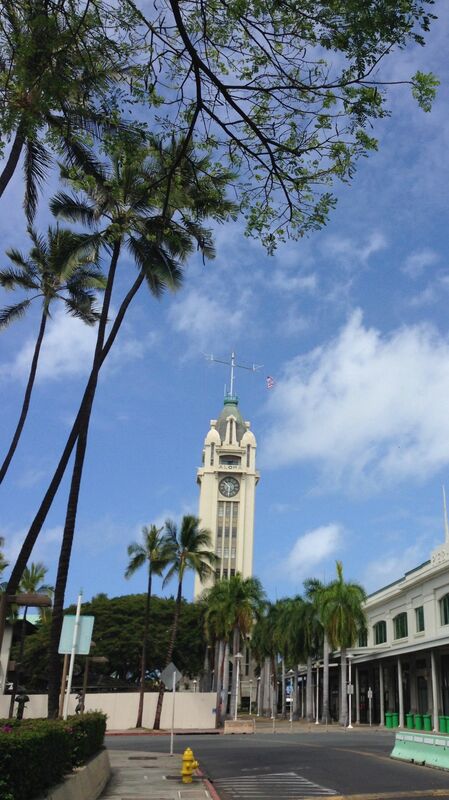 The final historically significant structure we visited was the Aloha Tower. Built in 1926 it originally served as a lighthouse but was decommissioned in the late 1960s and is now being revitalized by Hawaii Pacific University. The view from the observation deck is outstanding. In order not to be in the way (and view) of other visitors to the deck, we decided to sketch the tower and its surroundings from the marketplace. AJ: For many months I’ve been walking by a particular construction site daily. What started as a house remodel now seems like a complete rebuild except for part of the carport and a rain gutter! 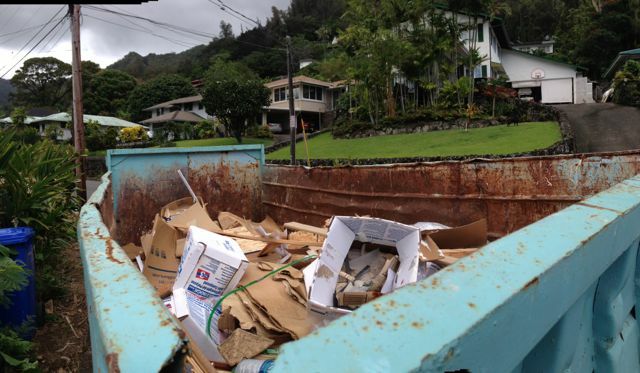 Several roll-off containers have been filled with demolished parts of the house and then carted away to the landfill. 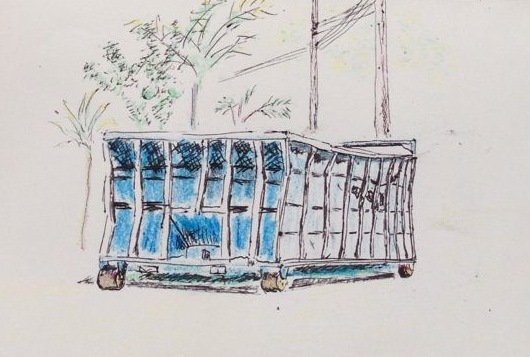 Since the project is nearing completion, I wanted to attempt a sketch of the dumpster before it is permanently removed from the site. Similar to my last sketch session, I decided to begin with a sloppy “planning sketch” to see what would be most problematic … as well as to give myself an added chance to get the perspective in better shape the second time around. I also wanted to test the color palette available to me as I only had four crayons (yellow, red, green, blue) and my usual black TÜL pen. 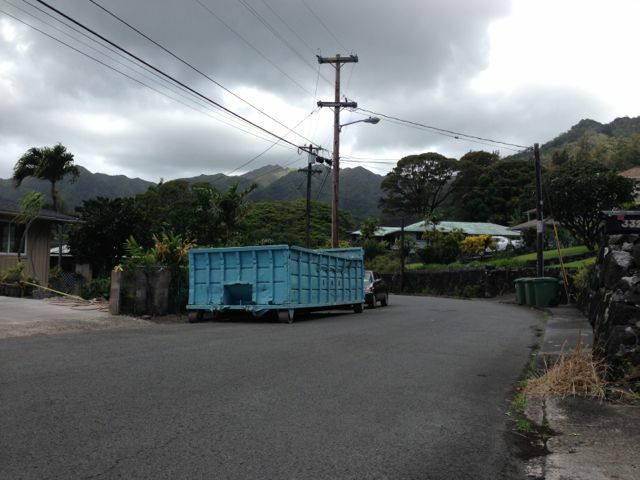 I almost ended my session with just the blue dumpster pictured … and nothing else … but I remembered my improvement goal from last session. That was to practise including background (and foreground) details to anchor the target item in its setting … and on the page. I plan to keep focusing on that goal in the future. In all, it was a fun morning and I was pleased that the rain stayed away long enough for me to put something on paper! 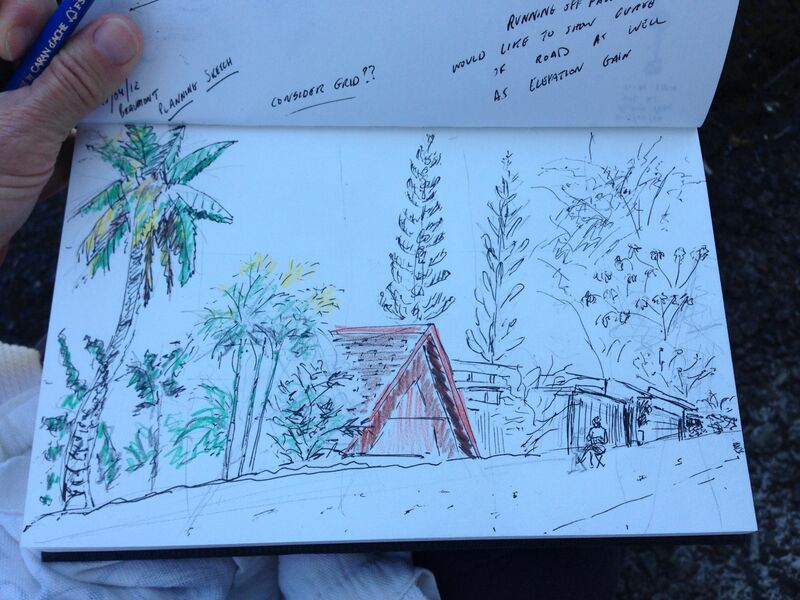 The container I chose to sketch today is one I know well. As the construction is wrapping up, the container is seeing only light use, filling up slowly, mostly with cardboard and small chunks of wood. Sketching the interior of this rusty and rather banged-up specimen proved to be too much of a challenge for my still budding watercolor skills. Yet again I succumbed to the temptation of going after the details too soon (or at all), rather than using light colors on large areas first and then building depth and contrast selectively and deliberately. Argh. It was fun though (in a mildly masochistic sense) to realize my mistakes as I made them and to attempt to rescue at least some of my sketch. Needless to say, the whole operation took far too long, forcing me to abandon much of the background. Lesson for next time: bring brushes of different size, focus on water management, clean “palette” every now and then. Sebastian: Although work on the house was largely complete, there were still indications of an active construction site. A portable toilet and pile of lumber were among some of the signs. This time, I decided to use one medium (pencil) and move away from my standard pen-watercolor combination. Once again, we had unique interactions with passersby. Most notably, we were asked a new question: “Are you guys OK?”, which diverged from the usual “What’s going on?” or “Is this a school project?”. 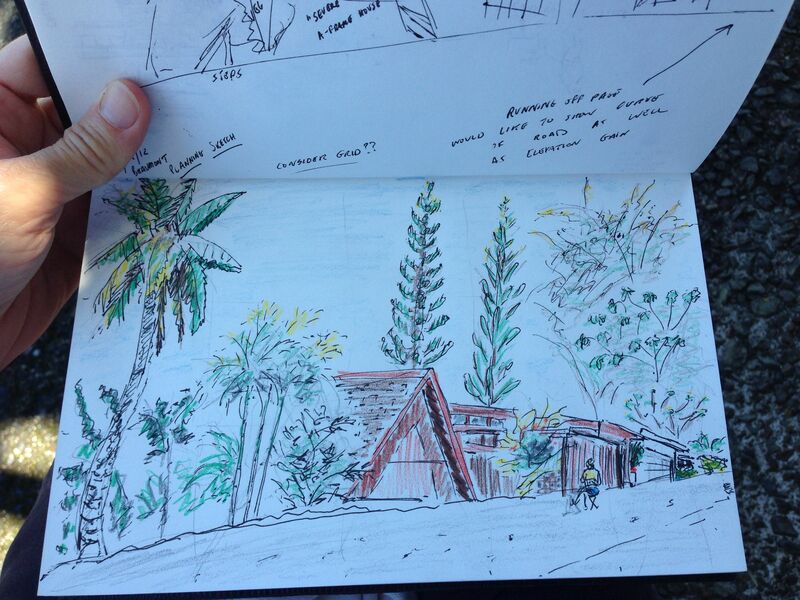 It was a nice morning to be out sketching. 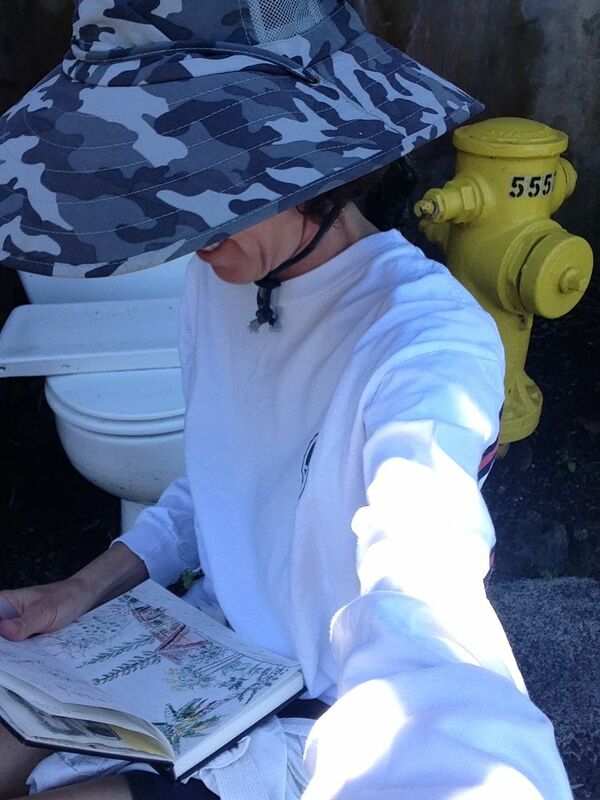 Next, I may do a series of portable toilets (as shown) or older cars, since there are a few to be found in the neighborhood. AJ: As mentioned in my last entry, my goals were to ignore my status as a beginner, avoid getting overwhelmed / frustrated by the detail in front of me, and practise without reservation. 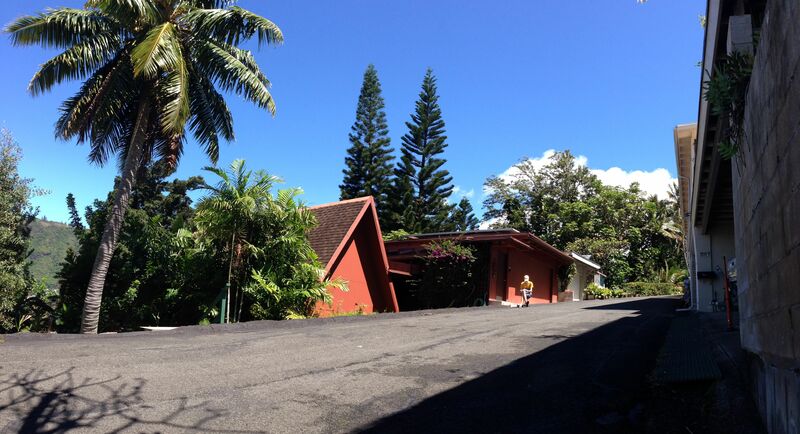 On this beautiful morning in Honolulu we scouted out an interesting section of a neighborhood. It was a pleasant mix of natural (vegetation) and unnatural (manmade) elements. I started a sketch in pen (TÜL GL1 – black, medium on Pentalic 65 lb, 8″ x 5.5″ paper for dry media) and realized that the perspective and scale were wrong; I had a big challenge on my hands. My attitude evolved to one of making lemonade out of lemons though … and I decided to consider my first attempt as a “test sketch” to see how the scene would fit on one landscape-oriented page. 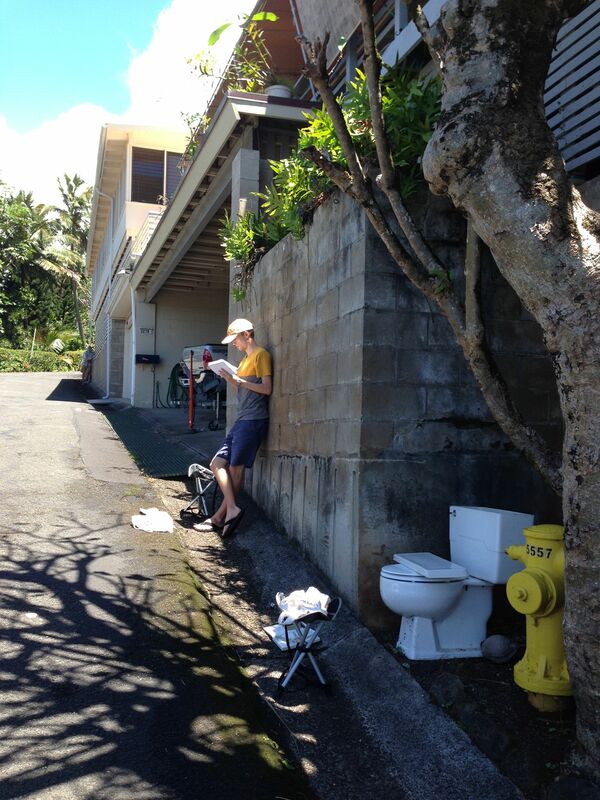 As an aside, I was kept in good company during my sketch and made fast friends with a fire hydrant and discarded toilet. After applying watercolor pencil (Caran d’Ache Fancolor pencils) throughout the work I used a wet brush (Sakura Koi water brush – medium) to blend and spread the colors. At this stage I am least confident about whether I am improving or ruining the picture, but have to admit enjoying the process most at this point. 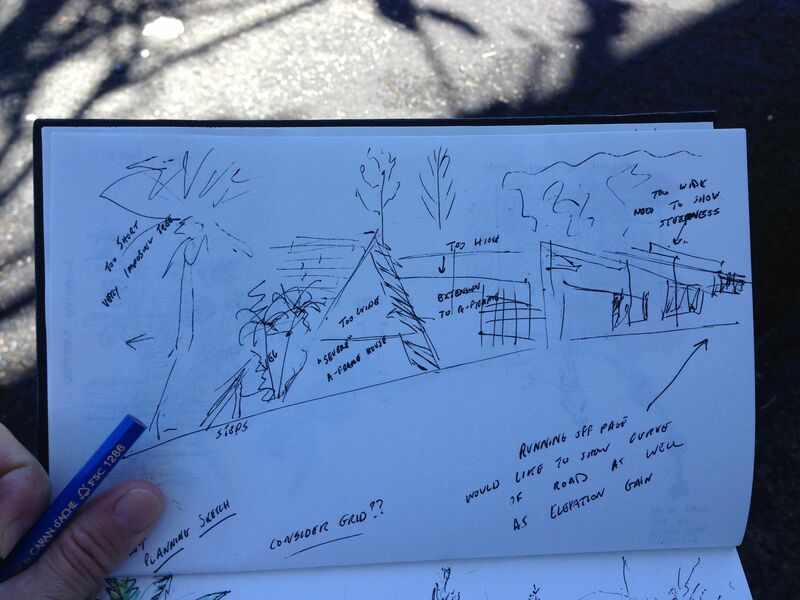 One area that needs particular attention is how I handle the background of my sketches. Typically, I end up with a lot of bland white-space surrounding the foreground / target elements and consequently a “flat” drawing. In the future I would like to pay more attention to how I can show much more depth in the scene captured. 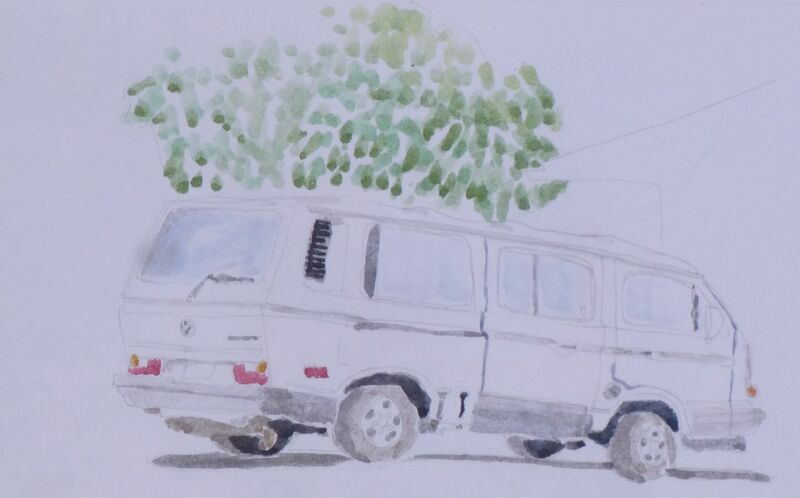 Harald: Taking up position on a different stretch of the same street, my goal was modest, namely to improve upon my previous foray into watercolors. Although figuring this out for myself might neither be the fastest nor the most reliable approach, I believe I learned a lot today. For instance, don’t skip the pencil outline. Start with a layer of light colors. Keep your watercolor set clean or you will end up with everything looking like different shades of brown. Add detail with a fine brush in darker colors. All pretty obvious, but in last week’s attempt I still somehow failed to understand (or adhere to) even the most fundamental rules. Today’s result is far from frame-worthy, but I am quite happy with the progress made. Strategy from here on: practice some more… and then take a class! Sebastian: It was a nice morning to be outside, and a few people stopped to see what we were up to. 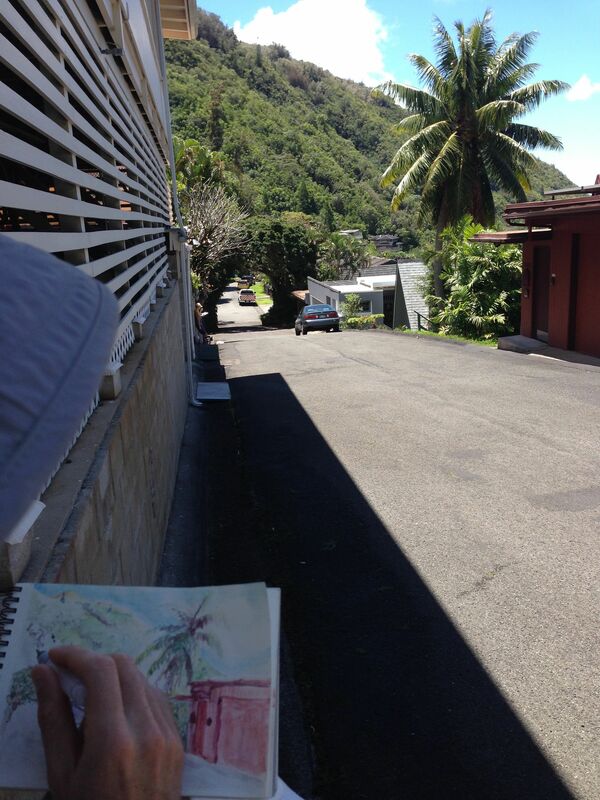 We also received a request from a resident of the neighborhood to ask permission beforehand – pointing out that we were sketching on a private road. Our first encounter with a concerned neighbor. On the sketching side, I felt less satisfied mainly because I ran out of space on my 9x6in. paper. The page was quickly filled with details I wanted to capture and the two media I used. Outlining everything in black pen left little space for color. My pen and watercolor method is something I have perhaps stuck with too closely. Using a different medium or approach may have been more effective, especially when trying to sketch such a large scene. 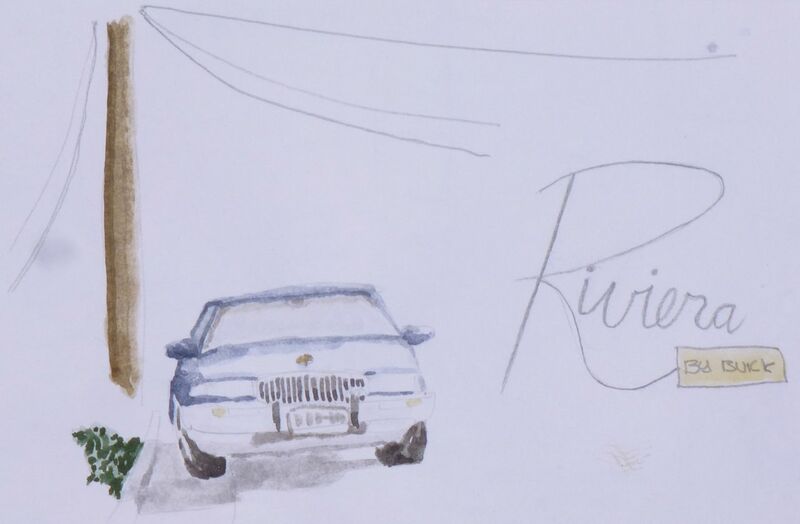 Next time, I want to use one medium (watercolor, pen, or charcoal), focus less on details, and capture more of the atmosphere – something like what Harald did in his sketch above. 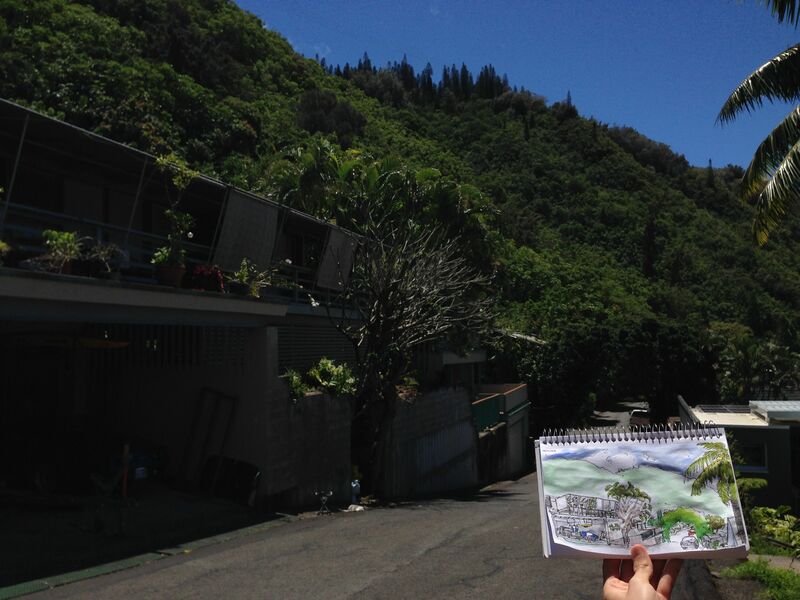 In an attempt to capture the subject and challenge ourselves to use a different medium or technique, we visited the same residential house in Manoa Valley twice. 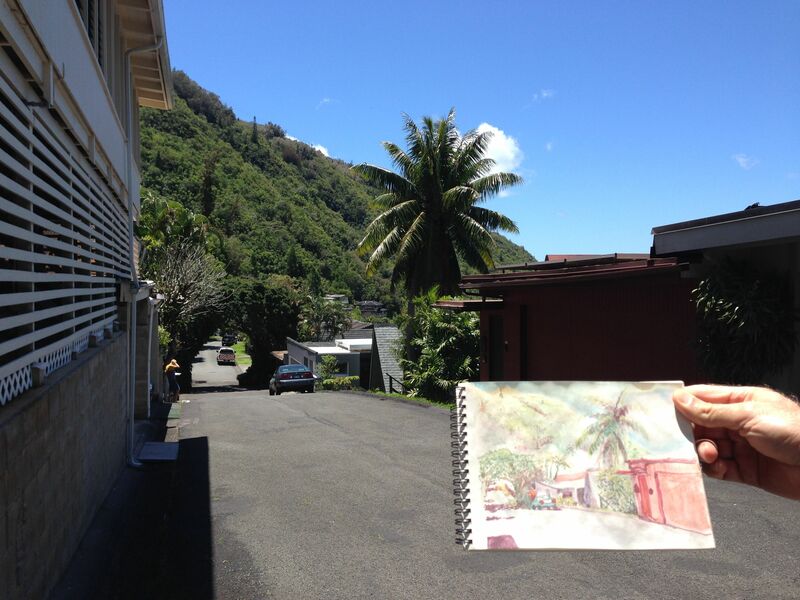 Our sketches, although all of the same house, look quite different. AJ: Last time we sketched this house I felt very overwhelmed by the challenge of capturing the perspective, presenting the depth / value, and even sizing the various sections of the house properly in relation to one another. This time I decided to focus on one area (front entrance) to see if I could turn that into a productive learning experience. I chose to use pencil because I feel like it is the biggest challenge for me and something I have tended to avoid. I am not as satisfied with the result as when I use ink / watercolour, but I feel like I should try to work on the fundamental aspects of drawing a bit more! Harald: I managed to ruin several previous sketching efforts (mostly pencil) by not knowing when to stop. I tried to do better this time by using pen and deliberately starting with only crude outlines of the most basic elements of our target house. Ultimately I committed the same sin again though and did more damage than good with ill-conceived cross-hatching. To end on a positive note, I quickly jotted down another very rough sketch in order to return to that earliest phase that I felt best about. None of the results are satisfying in their own right, but I was happy to have learned more about what I need to focus on in the future. Progress of sorts! 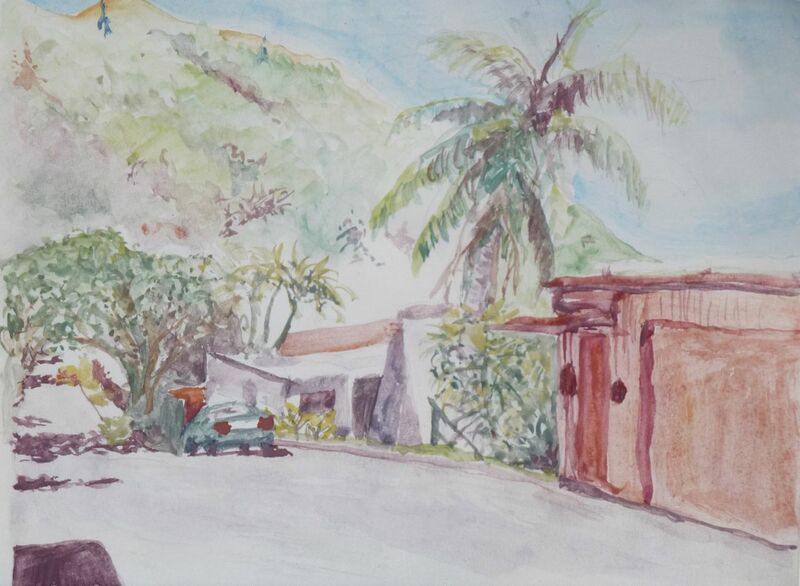 Sebastian: For my first sketch, I used my standard supplies – a pen and watercolor set. It is a combination I am familiar with and am trying to improve. I decided to go out of my comfort zone for the second sketch. 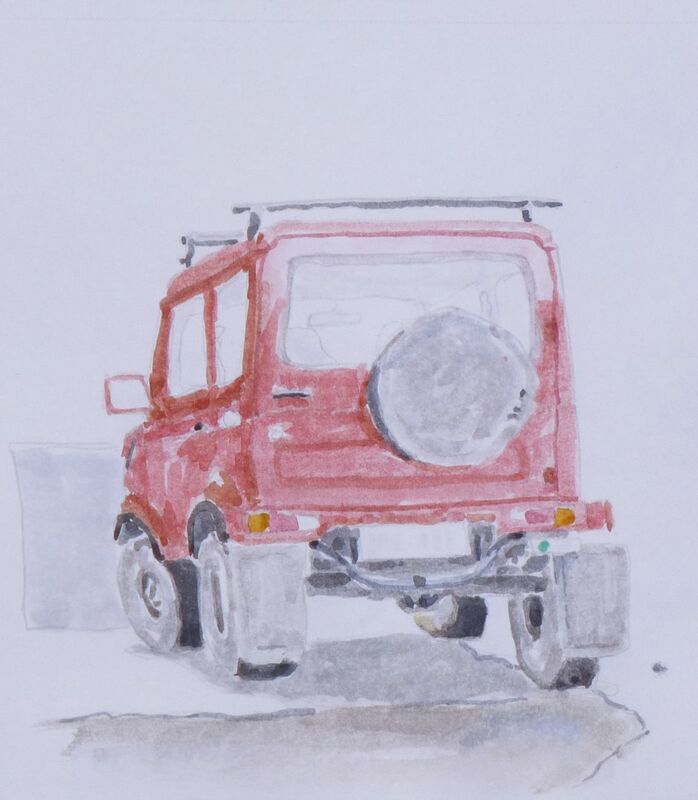 I had, unsuccessfully, used watercolor pencils before and decided to give it another try. My sketch (initially flat and geometric) progressed toward a more three-dimensional depiction with cross hatching and watercolor washes. Instead of an hour-long sketch, it turned into a two hour project. I struggled with it and ended up with something very different from what I normally do.